Happy end of Summer everyone! Things are busy as usual here, but happily so. Quick Thunderbean update: I’m happy to say that the Willie Whopper set, with all luck, will be back from replication next week. I’m hoping the special glass made for the pre-orders are back too. Snafu is now in the que as well, and will be most likely replicated and back here by mid-October. The Thunderbean Thursday special set is nearly completed, and we hope to send them at some point next week or early the following week. As I was looking through some of the hard drive archives of things we’ve transferred, a reel we transferred for Mid Century Modern, Volume 1 caught my eye. It was lent for the project by Dave Kirwan producer and historian, who also provided a very nice commentary track for the film on the DVD. Shamus Culhane Productions was, of course, just one of many small outfits producing commercials in the early days of Television. This is a 16mm print that was most likely sent around to ad agencies or owned by a sales representative. It has a variety of ads from the studio, and from the looks of it, these are spots of varying budgets and timelines. My guess would be that Culhane didn’t ask for top dollar on their spots, even the fully animated ones, and that they were bidding against many other companies to win the jobs. Culhane discusses this period a little in his book Talking Animals and Other People, detailing some of the dealing with companies in producing spots. 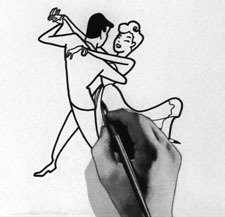 You get a pretty good idea of what the studio’s output looked like in the early 50s from this showreel. 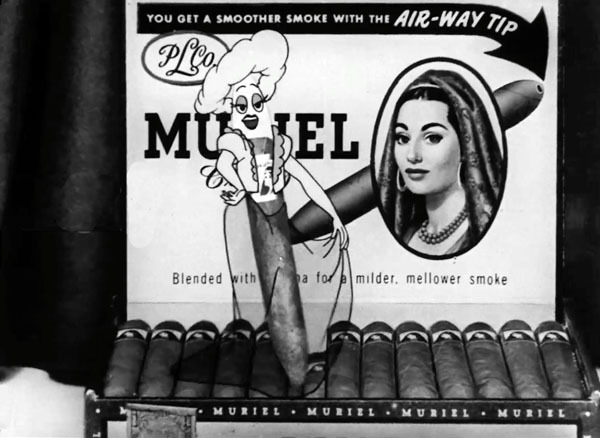 The Muriel Cigar ‘Come Up and Smoke Me Sometime’ commercials are still the standout, and one wonders how many spots Culhane sold on the popularity of those commercials alone. They may be the most clever spots on the reel. Does anyone know if the Van Dyck or Muriel spots were made first? It’s a but of a bummer that none of the Ajax spots are on the reel, but the ones that are here are fun. It’s nice to be able to see them in good quality with clear sound- many copies of the Muriel spots have fair at best sound. While not officially in production yet, I do hope before too long to do a Blu-ray of animated commercials- either lots of various spots, or one concentrated on a specific studio. It’s really hard to find good copies of so many of these films if you’re looking on video, and there’s really amazing things out there, often preserved by the film collectors, like this reel was. Make sure to turn it on HD if your computer is fast enough to run it. That Muriel commercial never LOOKED better! Another great post! Shamus and his crew sure knew how to push a product! The Muriel cigar ads were especially effective! It’s the Mills Brothers who are singing on the Paradise Wine commercial. 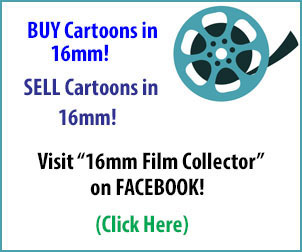 I don’t know how you find these ads and, yes, classic TV commercials in general, outside of the handful that we’ve seen on so many collections again and again, must really be hard to locate. I don’t even know where the average collector goes to find them, especially since I always felt that, once the ad campaign has finished its run, the films themselves are destroyed. There are certain ones, not always animated, that I’m looking for just for their wild technique or the odd way of advertising the product in question and, as it turns out, none of these desirables have shown up yet. 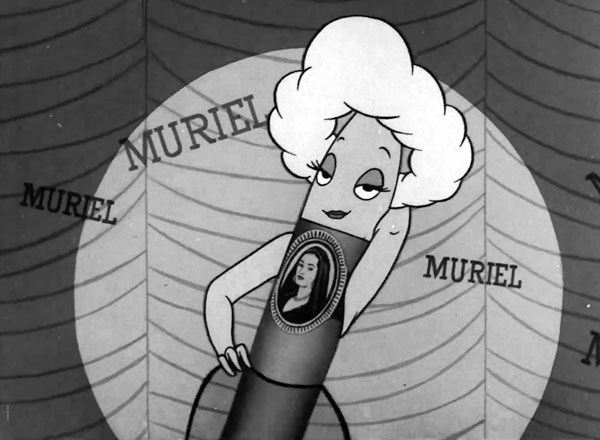 I guess there were a few different Muriel Cigar animated ads, the most popular being sung by Edie Adams, but the ones you’ve chosen here really sound quite good, far better than copies I’ve seen from other sources. The first ones I’d ever heard had horrible sound quality, but they’re still fantastic! I wish you a lot of luck on the sales of any further TV commercial compilations, because I hope that more classic ads surface, animated or otherwise. I was aware that Shamus Culhane got into the advertising field, but I wasn’t aware just what he advertised. I know that Tex Avery had done this, too; did they ever work together? All good news to hear titles are coming along. I’m sorry to sound like an old record stuck in the groove, but whatever did happen to the replicated Van Beuren Blu-Ray discs? It would be good to know we have those in hand before moving on to the upcoming titles, don’t you think? Thanks Steve! A commercials disc does sound great too. Wow! These are fun! I wonder whether my Dad worked on any of them? He was on hiatus from the Disney Studio 1948-51, and I know he had some dealings with Shamus Culhane, but I don’t know what they were. He also did some stuff for Hal(?) Sutherland, including a promo film called “Lucky Bill” and featuring my little brother David who finds a “lucky” dollar that gets spent for TV advertising–the very best use for one’s dollar! Any of that stuff still out there? Dad even co-founded Animated Video Films with A.C. (“Ace”) Gamer, but they didn’t get much business. Their most memorable was the Buster Brown spot, which many people remember: “I’m Buster Brown, I live in a shoe; that’s my dog Tighe, he lives in there too!” The shoe people ordered many flip-books for their annual shoe convention. The third man at the table in the Weathervane Suits commercial is character actor Bartlett Robinson. Always fun to see gems like this! I’m not so sure it would be a sales reel, because the leaders would not have been left in between spots. Rudy Catalidi worked on several of these spots. Lou Kachivas was his assisant, Fred Wolf later to be the founder of Murkaumi Wolf studios and Fred Crippen worked at Culhanes studio as well. 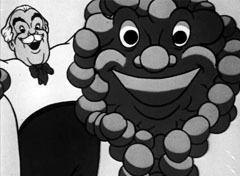 Jack Schnerk also animated on these spots.